I don't remember previous Novembers "falling back" quite as hard. Daylight saving time happened this past weekend, and it hit me like a brick wall. One bright spot is that 6am sunrises have forced me to wake up an hour earlier than usual. Had it not been for a week-long ordeal with a screw in my tire and multiple tires being replaced, I may have been able to get morning workouts done. As I write this post, I'm sitting in a Starbucks waiting for my car to come down off the racks. Hopefully as the weekend approaches, my vehicle isn't the only thing that has better traction. There are several races on tap for the month, and since this post is coming nearly a week in, one has already taken place. Not only do we have the oldest race in the area happening on Thanksgiving morning, but the most recent addition to the calendar covers a brand new route in uncharted territory. Lakefront Classic 10K & 1 Miler (Saturday, November 2nd @ 7:45am) - The New Orleans Track Club extended this race's history, reinventing it with updated distance options along Lakeshore Drive at Lake Pontchartrain. The beautiful, albeit windy morning, was great for racing. Check out the recap of my race HERE. Crescent City Fall Classic 5K (Saturday, November 9th @ 8:30am) - The younger, but more mature sister to the Crescent City Classic 10K occurs every fall with a smaller, more competitive field of runners. It's the only 5K option that counts as a seeding qualifier for the big show in the spring. Check back tomorrow for a full preview of the race. Middendorf's Manchac Run 10 Miler & 5K (Saturday, November 16th @ 8am) - I'm adding this race to my calendar for 2013 as part of my training for my fall / winter marathon schedule. While I'm not terribly familiar with the course, it'll be an interesting experience that concludes with a post-race meal of Middendorf's world famous crispy thin fried catfish. Heart & Soles Half Marathon & 5K (Saturday, November 16th) - The River Parishes get in on the half-action with this race benefiting the Cardiovascular Institute of the South. 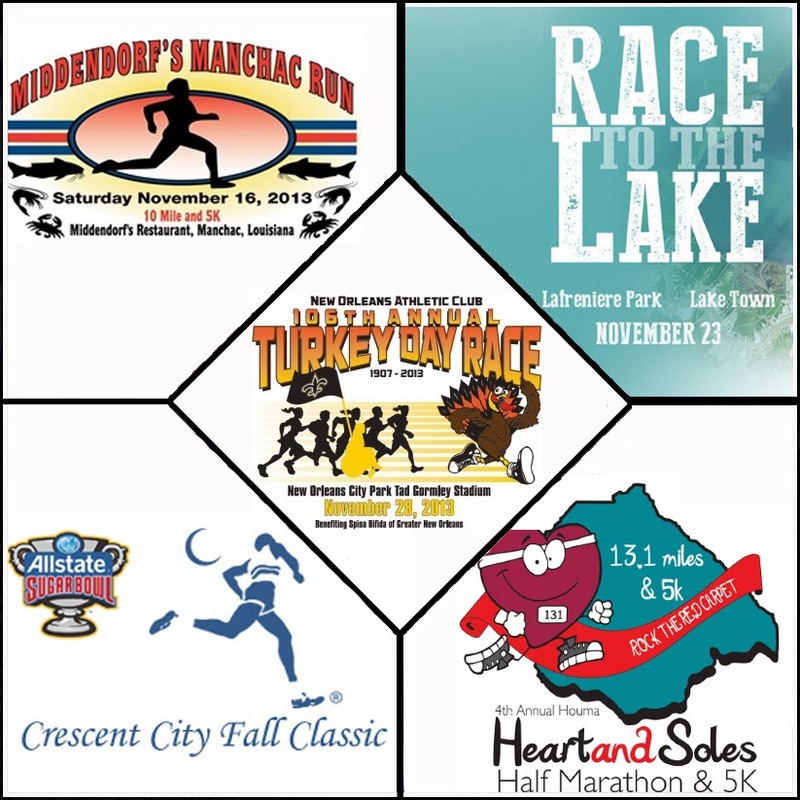 Race to the Lake 10K (Saturday, November 23rd @ 8am) - The newest addition to the local race calendar shows how quickly the 10K distance has grown. The Race to the Lake has been heavily promoted in suburban NOLA, especially on street corners along Veterans Blvd. That's with good reason, as the course starts in Lafreneire Park, winds through Metairie and Kenner on their busiest thoroughfares, and concludes near the Pontchartrain Center on the Kenner Lakefront. 106th Annual NOAC Turkey Day Race 5 Miler (Thursday, November 28th @ 8:30am) - Head off the tryptophan induced coma and start the day guilt free with one of the largest New Orleans Track Club races of the year. There's plenty to be thankful for with this annual tradition, as families kick off the morning in City Park. The parade will still be on TV when you get home, and the turkey will still be in the oven. Personally, I can't resist having an excuse to go back for seconds (or thirds) of cornbread dressing. Mississippi Gulf Coast Marathon, Half, & 5K (Saturday, November 30th @ 8am) - My first full marathon of the season is looming off in the distance, but it's closer than I care to admit. The double loop course circles Stennis Space Center, and is the epitome of the "small town" marathon. It's super organized, well attended, and the most affordable race you'll do all year. That being said, there's no crowd support and the majority of the course is lined with pine trees and military barracks as far as the eye can see. If you're mentally capable of being alone with your thoughts for several hours, this is a great chance to BQ at a close-to-home race. Options are plentiful for runners this month, with races for everyone. You don't have to travel far to find a distance that fits your needs. While the quantity of local races increases, so does the quality. Organizations like The New Orleans Track Club, NORSI, and the CC Fitness Foundation keep stepping up their game, constantly tweaking their calendars and races in response to feedback from its participants. Also a positive step is the influx of other organizations coming in to the market to put on new events that rival those of big cities. As runners in the Crescent City, we have lots to be thankful for in 2013, and even more to look forward to in the coming year. Whoop Whoop!! Will I actually get to see you at a Race?! Ill be out of town from the 21st-30th so Ill miss a bunch of the other ones than returning for the Baton Rouge Beach Half! You may get lucky with getting to see me in person! Total win for you, Nicole! Hahaha. I'm also planning on the Baton Rouge Beach Full, as it's my 5th anniversary race. But you're getting ahead of yourself. This is a NOVEMBER preview! Can't way to meet up. I ALWAYS get ahead of myself you dont know that about me by now LOL!